Have you ever wondered what it would feel like to be an Olympian for a day? 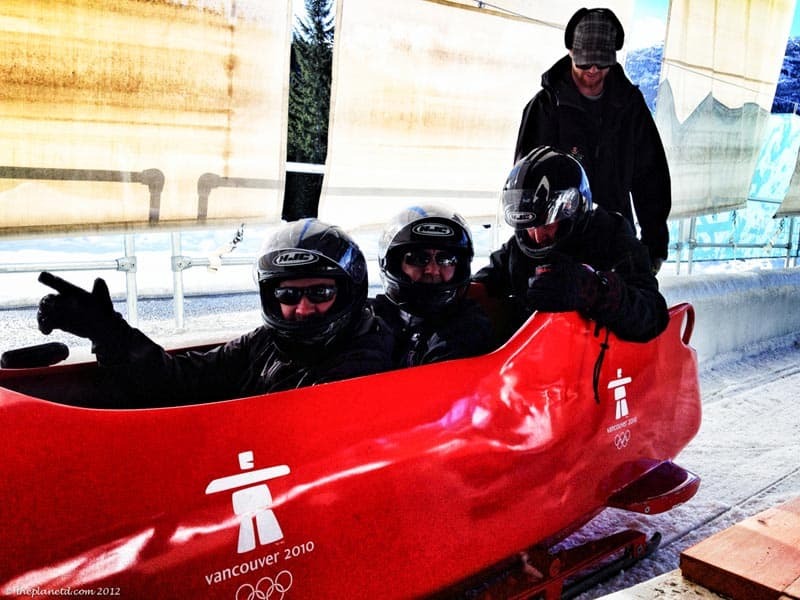 When you bobsled in Whistler you'll get to fulfill that dream. Imagine the thrill of speeding down the track just like the Olympic athletes of 2010. 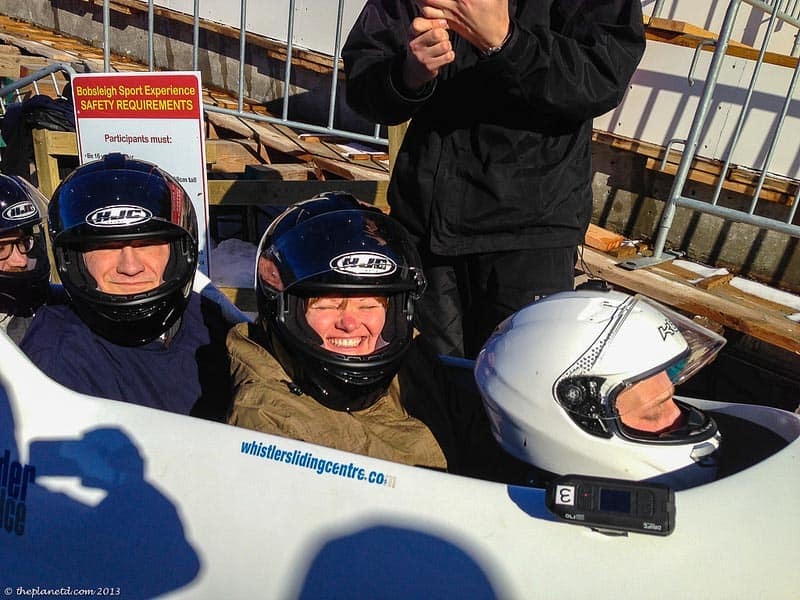 With former world class bobsled drivers at the helm, we had a once in a lifetime opportunity to shoot down the down the fastest Bobsled track in the world reaching speeds of 125 km per hour. 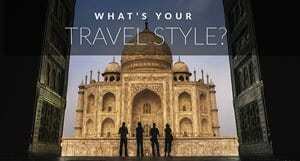 You don't need any experience or training, just a little bit of guts and a zest for adventure is all that's required to bring home an everlasting memory from your travels. 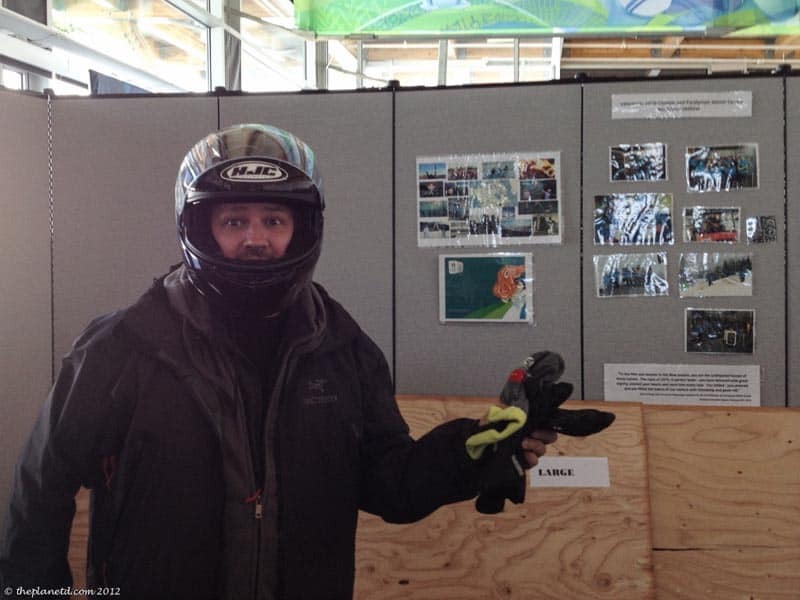 We arrived at the Whistler Sliding Centre with eager anticipation for the ride ahead. We didn't quite know what to expect and had visions of falling down while trying to jump into the bobsled at the start of the course. 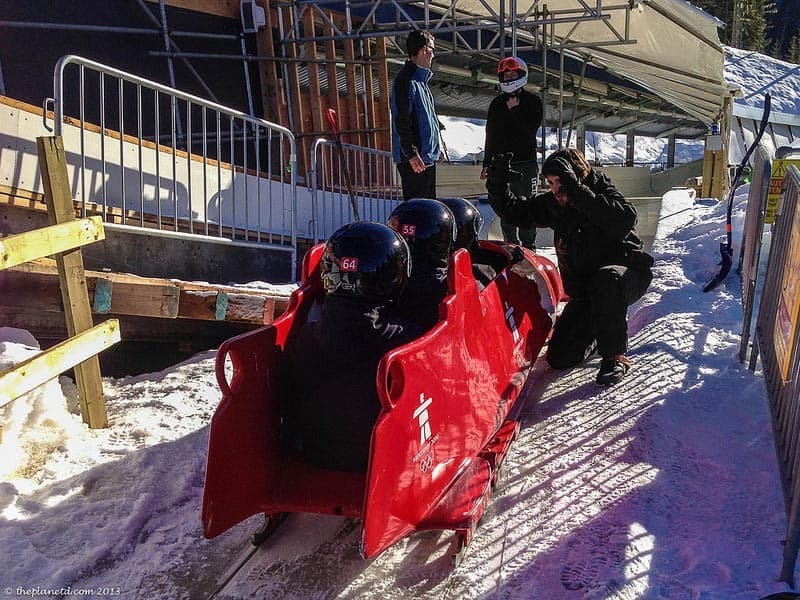 As we quickly found out during our half hour briefing session, we weren't going to be running along while pushing the bobsled at the start of the track. It would be impossible for amateurs to successfully squeeze four large bodies into this tiny coffin like tomb, so instead, they had us sit one by one in an orderly fashion before having a staff of two people push for us. This isn't a makeshift bobsled course designed for tourists only. There are no tracks holding the sled on course it's a track made of ice and a smooth fibre glass sled whizzing down a winding course for 45 seconds of pure adrenaline. It's a far cry from our Jamaican Bobsledding experience, but we were reminded of it when we found out that Pat Brown, the coach of the Jamaican Bobsled team of 1988 is one of the drivers at the Sliding Centre. That story went on to be featured in the movie Cool Runnings starring John Candy. 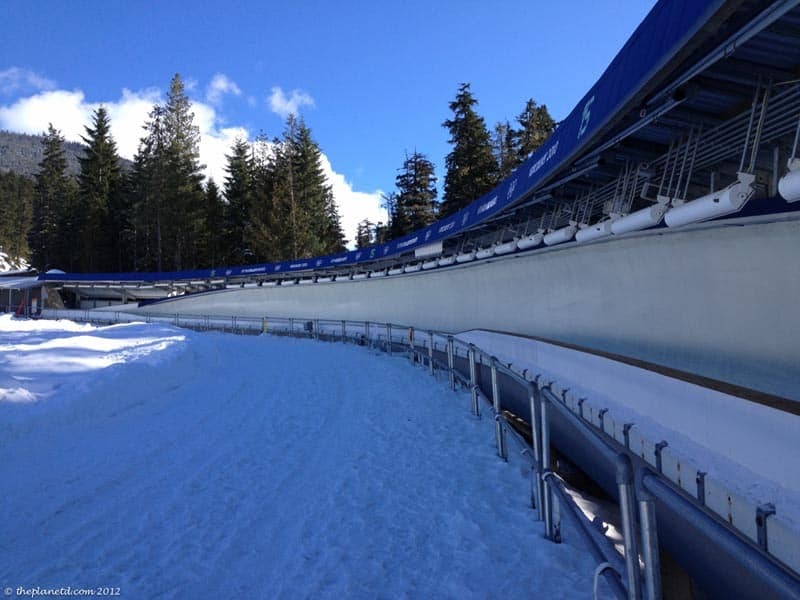 The Whistler sliding centre is one of only 15 competition sliding tracks in the world and athletes train and prepare on this track on a daily basis during the winter months. However, for a couple of hours each day, the Whistler Sliding Centre closes down for training and opens up to the public. You have your choice of skeleton or bobsleigh and anyone over the age of 18 and in good physical condition can take part. We arrived just as the public skeleton was finishing and needless to say, it looked a bit intimidating. The skeleton doesn't reach the speeds that the bobsled does, but you are on your own and there is nothing between you and the ice but your winter coat and a helmet! After our briefing and gathering up our helmets, we took a short shuttle to the start of the course. 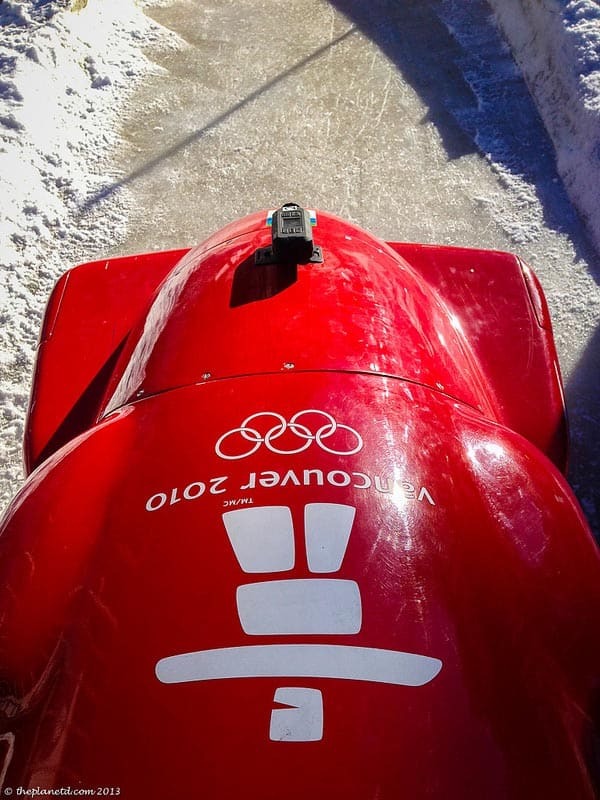 The public bobsleigh only uses 1/3 of the course compared to what the professionals do, but that's all you need. We were told to sit back and hold on tight. If we made the mistake of putting our head forward, we'd be stuck hunched over the entire ride as the g-forces would keep you down and you'd miss seeing all the fun. I made sure to take a strong stance with my head up while leaning back. I didn't want to have my head shoved down to the floor of the sled for the next minute of my life. Once we were loaded in, we were off in a matter of seconds. The experience was amazing. We it took a couple of seconds to accelerate giving us the chance to settle in, but once we rounded the first bend, we were sliding full tilt boogie and you could instantly feel the pressure on your helmet. It felt as if a solid concrete block was pushing down on your head forcing you into the seat. By the time we hit the 10th and final bend of the course, we had reached our fastest speed. It turns out that our team had the fastest time of the day reaching an impressive 126 km per hour. Dave was a distant 8th but like all bobsledding races, the distance is measured by mear nanoseconds. He was less than a second behind us! 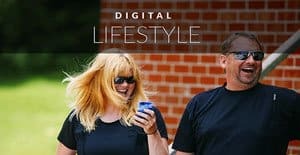 13 Responses to "Bobsled Whistler, Our Olympic Moment"
What a great experience. Not something I would automatically think to put on the top of my activity list when visiting Whistler, but now I’m definitely intrigued! 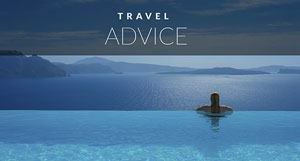 It would definitely make for a great story to share when swapping adventure travel stories. As a sports fan and wannabe athlete, I would love to try this. I have no coordination for winter sports but this would still be a lot of fun. I’ve done a luge so I am sure that is plenty of training. Ha! I think that the bobsled is a good choice over the skeleton. It’s less scary but goes faster. Next time, we’ll do the skeleton…work our way up in scariness. What a wonderful experience! Whistler is a close trip from my home. This looks like a lot of fun. 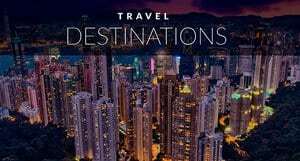 I’ll have to add it to my experience list and arrange a trip up next winter. Did you guys get the video? Wicked, you can also do the skeleton too. It looked really good and you get to go twice. 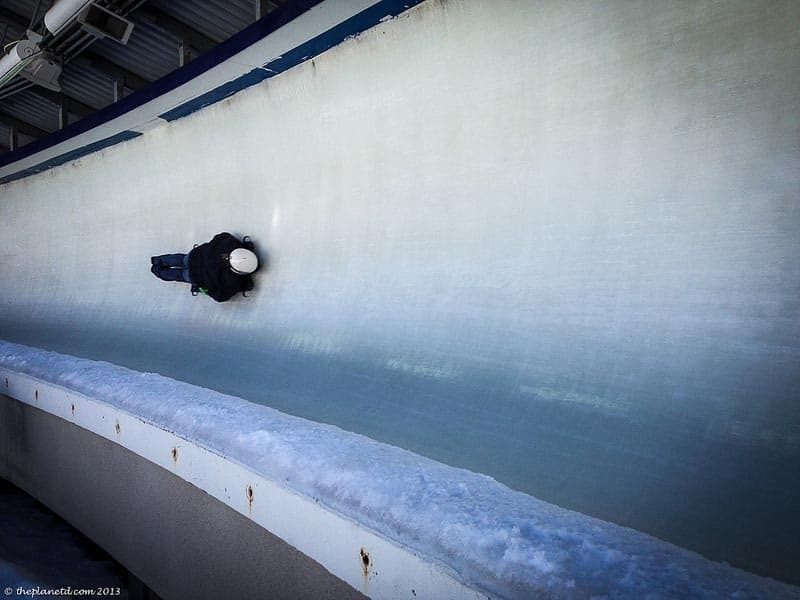 The bobsled is only one ride. However the bobsled goes faster, so it’s a tough choice.